Each of us adds to the council of not knowing as our own churning anguish rises from the radiant sea that is outshining the night sky. The sacred, it was said by someone who had studied forgotten and destroyed languages as if they were precious foreign objects, appears when everything is in its place. It assumes place. It assumes you have a place to put your feet and so do I. A place that might even be a stone pillow upon which you lay your head so that you might, tirelessly, watch the moon rainbow cross the sky, waiting for God. If place has disappeared into the wind shear of destruction, has the sacred tumbled into that pit as well? A poetry of place today as ravaged as the Disappeared and out of this, a mutant birth, if any. Repetition follows repetition, radiant, radiant, radiant – a rat striking the electrified button to turn on a synapse of relief in a metal cage insuring there is no escape from torture. This does not illuminate how I or you or we could have constructed Fukushima or torture chambers for humans and non-humans. A rat would not have thought of it, nor the Earth Sea Mother. A mental shift, a brain change, a devolution as rapid and extreme as climate change and created by the same thoughts and activities. “We are the earth,” we said as women concerned that we might disappear into the mind set of the corporate maw, “and how you treat us is how you treat the earth.” Or maybe we said the opposite: “How you treat the earth is how you treat us.” Or both. Knowledge and understanding are not remedy, we came to understand, as we stood and remain with Cassandra watching the on-going carnage; against our will, we become whores to it. Accepting that people I know have been tortured does not assure me I could survive it, or better, die of it when applied. And science, the great god of a depraved species, will soon offer a procedure or a pill, made of our own DNA, our own genetic material, to wipe out bitter memories. Related methods, newly tested on veterans suffering PTSD, can wipe out the memory of slaughter – what they did, what was done to them, their responsibility or lack of it – so that even wars may be erased from our memory, and consciousness will shrivel like an old balloon, and then the brain will wither, nothing in it but a false positive of Eden. The soldier forgets that he tortured while his torture victim writhes wherever she has been dumped to resume her rat life. Or maybe we can arrange for her to forget, as well. Not one of those murdered by government order will be brought back from the dead. Nor those vaporized by bomb blasts rivaling the sun. “Who asked you?” she answered. I thought this was our comedy routine. She died early, wailing at the injustice of it, without knowing she was being given the grace of escaping what was left of the twentieth century and the brutal beginning of the twenty-first on Planet Earth. 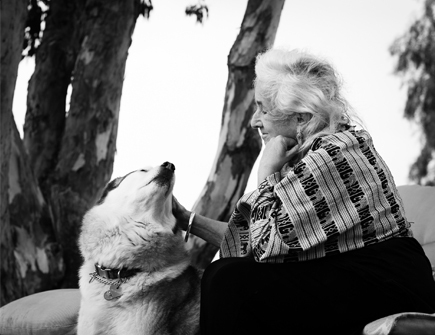 Deena Metzger is a poet, novelist, essayist, storyteller, teacher, healer, and medicine woman. She has taught and convened community for many years. Story is her medicine. She is the author of many books, including most recently, the novels La Negra y Blanca (2012 PEN Oakland Josephine Miles Award for Excellence in Literature), Feral; Ruin and Beauty: New and Selected Poems; From Grief Into Vision: A Council; Doors: A fiction for Jazz Horn; Entering the Ghost River: Meditations on the Theory and Practice of Healing; The Other Hand; What Dinah Thought, Tree: Essays and Pieces; The Woman Who Slept With Men to Take the War Out of Them, and Writing For Your Life. She has just completed a first draft of a new novel, A Rain of Night Birds.